Our weekend started on Friday lunch time when I picked up James from school early as he had a dentist appointment. 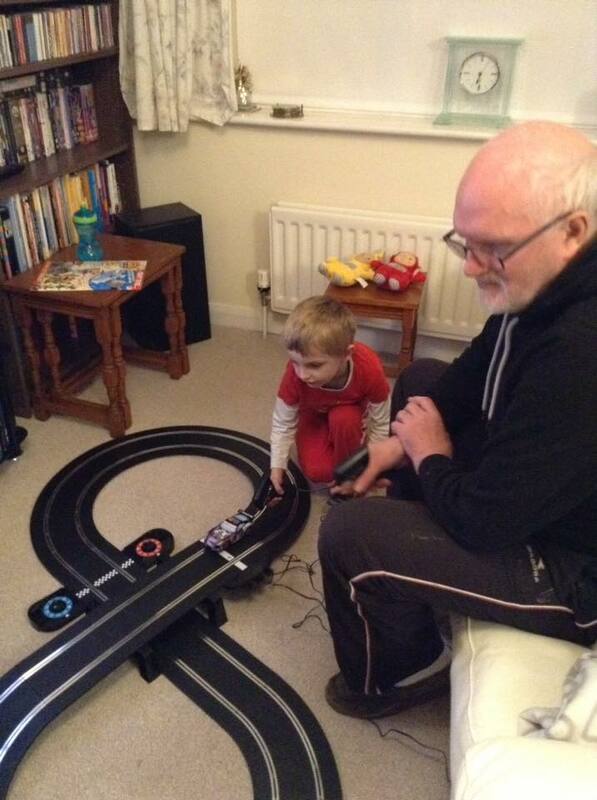 We were staying at mum and dads house that night and James loves it especially as he got to play on his new scalextric. Freddie was sharing a bed with mummy and he took up so much room!! Saturday started early when Freddie woke up at 6am, so it was peppa pig on the iPad in bed. 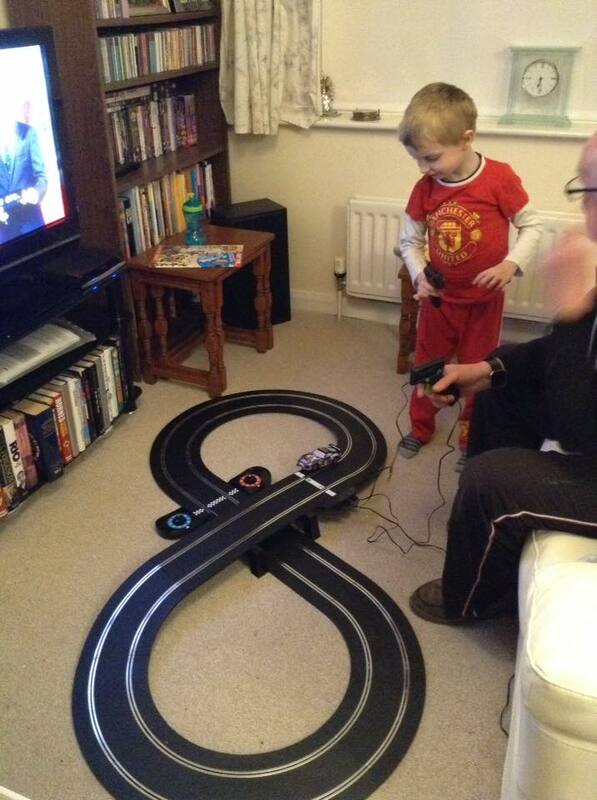 Gaga and James got up and played on the scalextric and somehow James managed to shoot his car off the track and it disappeared into thin air! Nana and Gaga eventually found it once we were at home as it had gone sideways under their tv unit! James had his hair trimmed by Gaga too! He also did his homework and his school reading book. Freddie was watching milkshake on channel 5 with mummy and he loved trying to copy the presenters dance routine for the Dinosaur song! 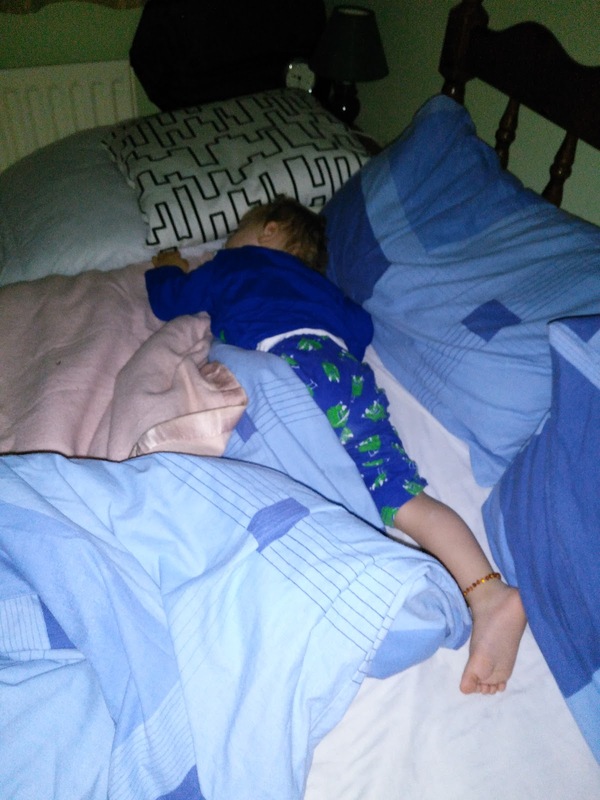 We got back home at lunchtime where Freddie actually had a nap. We had a walk down to aldi to look at the bedding in the special buys and buying a new duvet for mummy and daddy before it was time for tea and bed for the boys! Sunday morning started with the boys jumping into our bed and watching peppa and paw patrol on the iPad while mummy and daddy dozed. Once we were up we had a walk across to the local tesco to get some vegetables. Once we were home the boys and daddy did some FaceTime with daddy's parents in Surrey. Both boys loved seeing the cats! While they were doing this mummy was in the kitchen making tomato and pepper soup for lunch! So that was our weekend!! 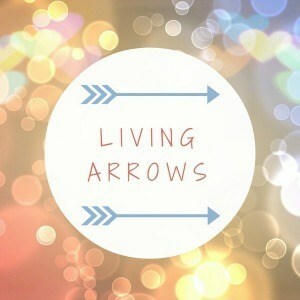 Welcome to week five of Living Arrows 2018! 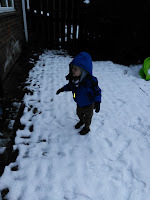 This week as been a pretty boring week as James has been in school all five days, Freddie had his two playgroup sessions and then his normal Sure Start group. These photos of James were taken after school one night. We had some toys to review and he was so thrilled to get them!! Most of the things we have done via here lately have all been aimed at Freddie, So to get an opportunity that is aimed at James, then it is brilliant! Freddie has been so full of beans this week, but he does like his down time when he snuggles up with his blanket and watches Peppa Pig via Netflix on the sofa! 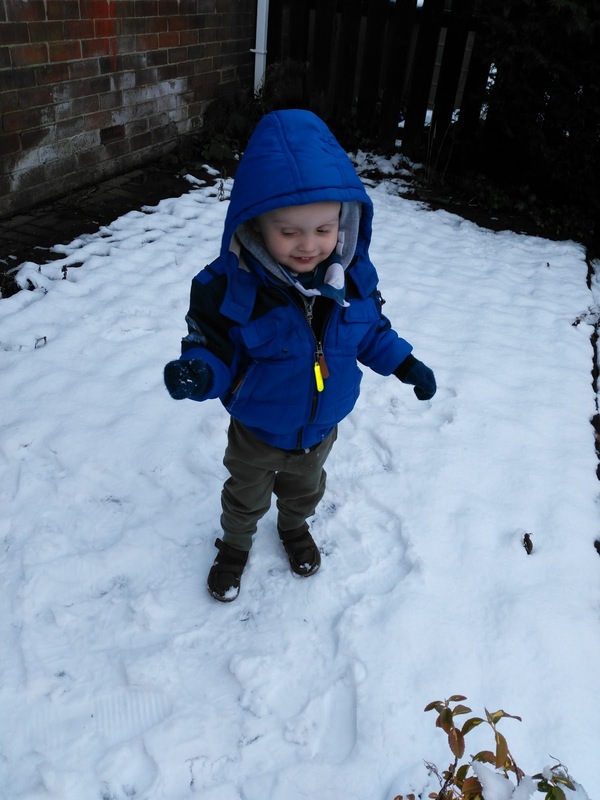 This week at Sure Start Freddie has had to say goodbye to two of his best pals who he has known since he was a few weeks old as they were moving house. He's really going to miss them at our group! Freddie has been playing with some of James old toys this week. He has taking a real liking to the playtime bus with phonics! 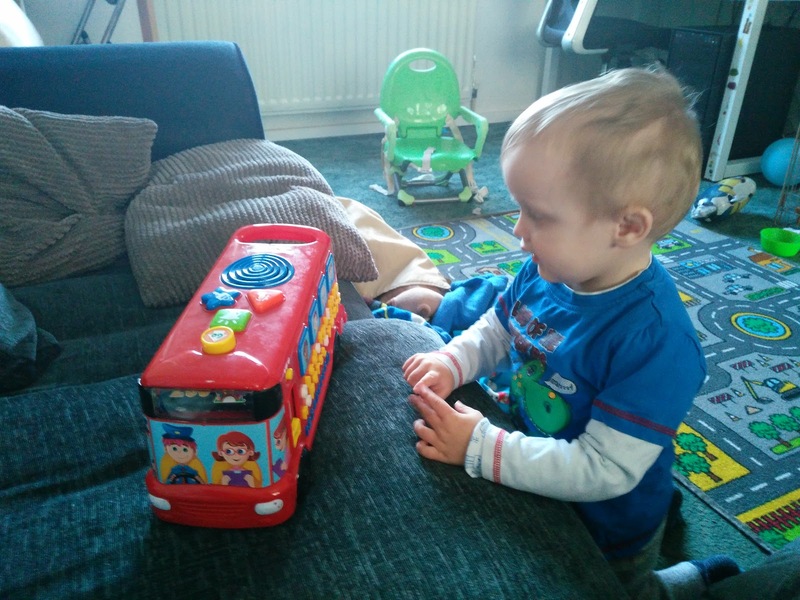 He loves putting it onto the music setting and dancing to all the nursery rhymes! Now that Freddie has started two playgroup sessions a week, our daily routine on Tuesdays and Wednesdays has changed. On a playgroup day, we are normally up by 7am. Mummy or daddy will have a shower while the other gets Freddie breakfast. James gets up around 7 for school and he gets dressed before his breakfast. Once boys are fed, mummy and daddy tackle any washing up along with a cuppa and then our breakfast. We have started making overnight oats to make sure we both eat in the morning as mummy is terrible for not doing this and then not eating till lunch time! 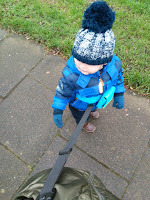 By half past eight Freddie is in the pushchair and James has his coat, shoes and bag on ready to leave. 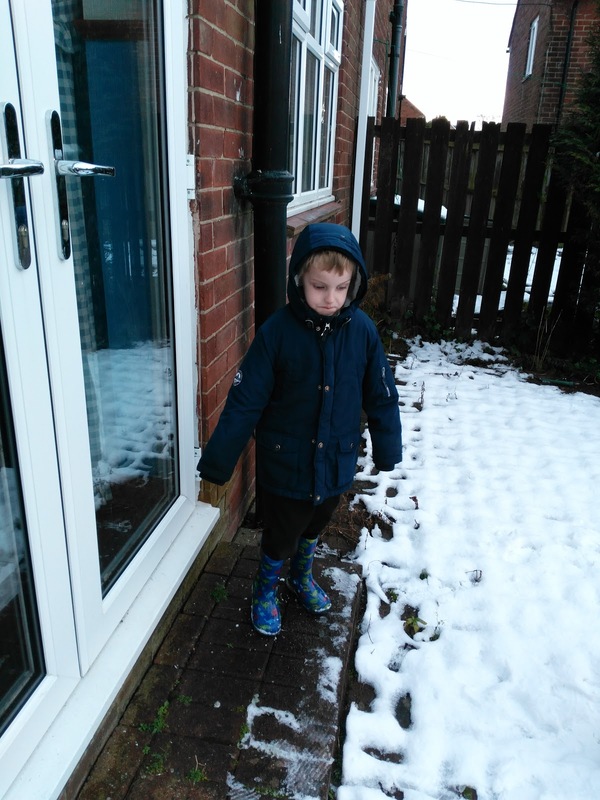 The walk to school normally takes about five minutes and the doors are opened at about ten to nine so mummy and Freddie are normally back home in the warm with a hot cuppa by nine at the latest. First thing mummy does once back is any washing up that is in the sink and put stuff away that is on the draining board. Then it's onto checking the washing machine and dryer. 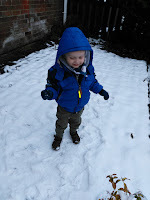 After that it's time to put Freddie's lunch together for playgroup. He's been taking mini sausage rolls, along with cheese and crackers, fruit drops and raisins. Then it's time to check his bag. There is always a full spare set of clothes in a wet bag plus two pull ups, nappy bags and some wipes. I always send a full set of clothes right down to socks as Freddie loves the water tray and likes to completely soak himself! 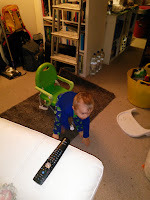 By the time all that is done it is normally around ten or half ten, so mummy has another cup of tea and sits down to watch some TV. 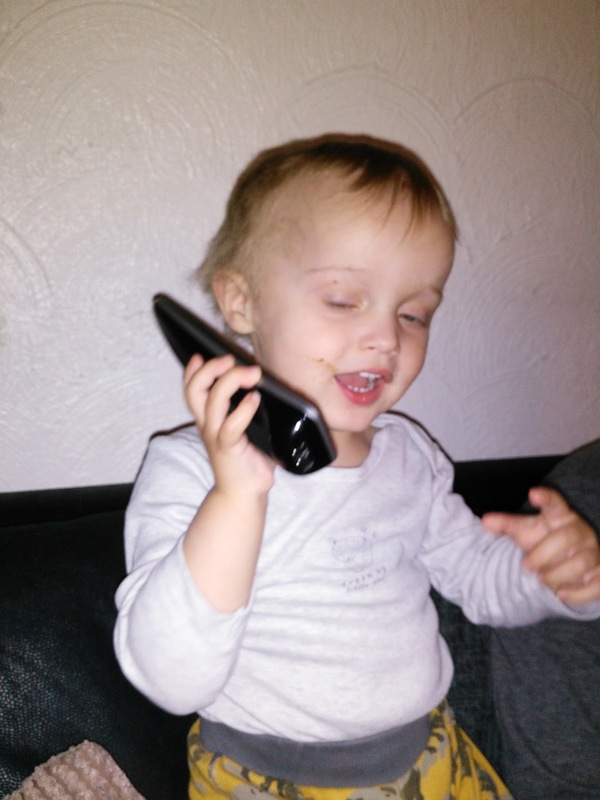 There is an alarm set on mummy's phone for eleven twenty. 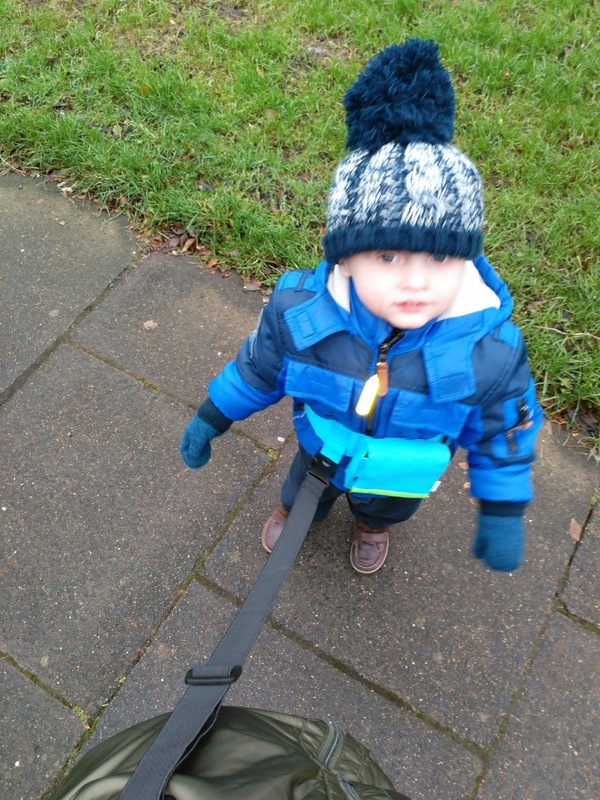 This is so mummy can change Freddie's pull up and start putting his coat on and mummy can get herself ready. 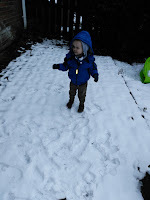 We would normally leave the house at about eleven thirty or eleven thirty five to walk up to playgroup. Once we are there it's coat and bag hung up and into the room ready to start! Once mummy is home, the first thing done is have lunch and then cook the evenings dinner. This is always done by 1pm so then the laptop is out and blogging work starts, emails are checked and replied to. Posts are scheduled on blog and on Facebook. Instagram and Twitter are checked. Normally there is a bit of down time to just catch up on BBC iPlayer or Netflix before the alarm goes off at twenty past two to get ready to pick up Freddie. Once the pick up alarm has gone off, mummy will nip to toilet put on boots, coat, hat and scarf! 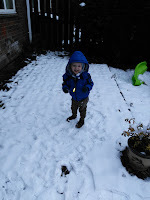 Its then time to grab the pushchair and walk up to the school! Mummy always takes the pushchair up to collect Freddie as he finishes at two forty five and we then have a half hour wait till James finishes school! Once we have James at three fifteen we head home and watch Cbeebies. Freddie is normally exhausted after playgroup so he will be wanting to eat his tea by quarter past four. 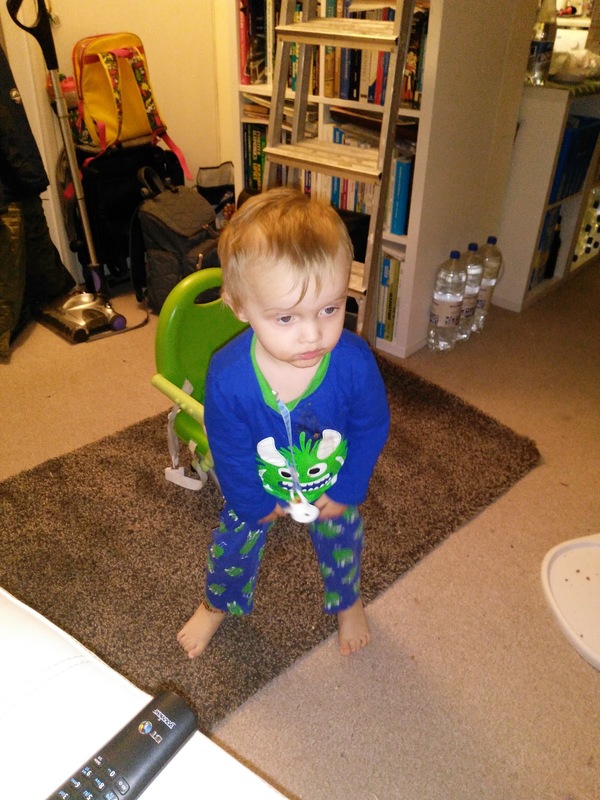 Hes then ready for his milk and bed by five pm. 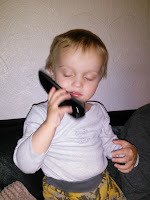 Mummy tries to keep him up as long as possible but he is normally in bed and asleep by quarter to six at the lastest. James will either have his tea when Freddie does or he will eat with mummy once Freddie is in bed. Daddy then gets home from work at about quarter to seven and James will put his pjs on while daddy has his tea. 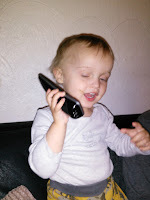 Then Daddy will take James to bed between seven and half past, while mummy will then get out the laptop and makes sure everything is up to date for the next day. 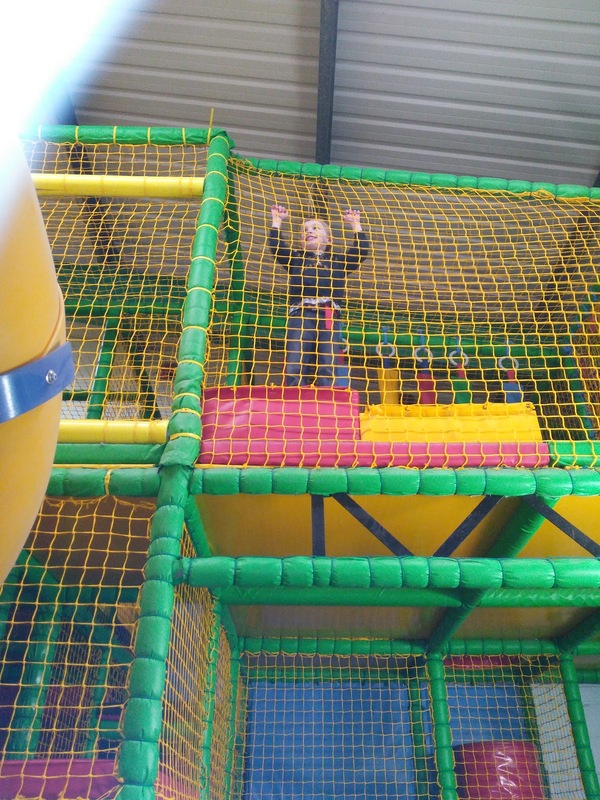 So this is our routine on a playgroup day! 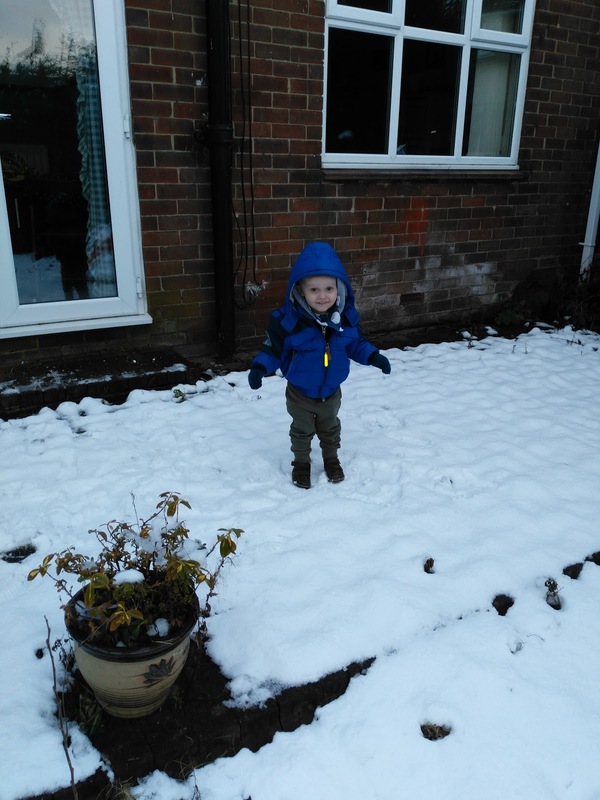 Its much different to a normal day when Freddie is at home! Welcome to the next part of our review into the BabyStart One Hand Fold Pushchair! 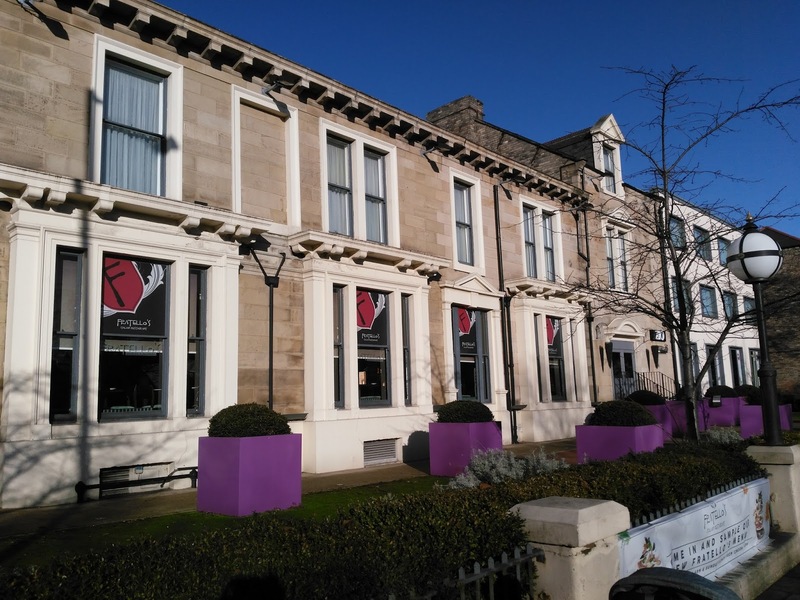 This post focuses on taking it out and about in Tyne and Wear. We were invited to Fratello’s restaurant, which is based at the Holiday Inn Hotel in Jesmond, to attend an event with Messy Little Thing. 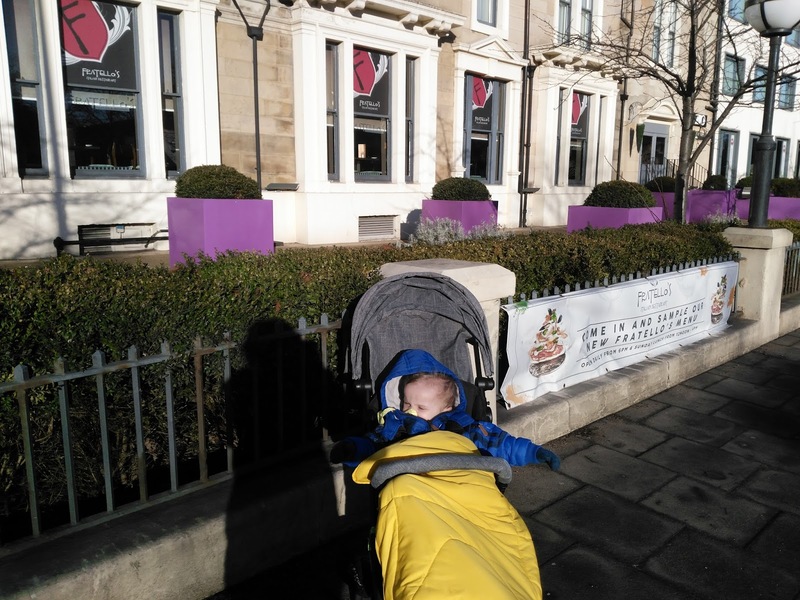 I thought this would be the perfect time to take the pushchair out on a test run in Tyne and Wear especially as it involved walking, public transport and then we would be having a meal in a restaurant so the pushchair might need to be folded down. We had a short walk from our house down to the local metro station and then a fifteen minute ride on the train and then a five minute walk at the other end! The pushchair passed the first test which was taking it backwards out of our front door like I do with our big pushchair. On the walk down to the metro station, the pushchair felt a bit odd to push, like it didn’t want to go in the direction I wanted it to go in. This was solved once we got to the metro station as I realised I had only taken one of the wheel locks off so one was on swivel and the other was on locked. 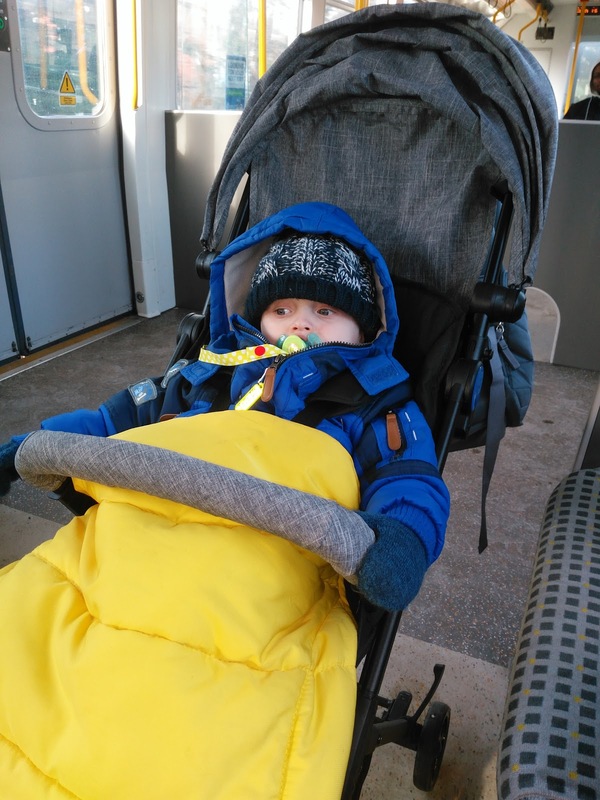 The pushchair went onto the train with ease and I was able to sit on the sideways seats by the door with Freddie parked in front of me and he took up very little room. People could still walk past and down the aisle with ease. At the other end we got off the train no problem and into the lift. The biggest test for the pushchair in my opinion would have been the ticket barriers at Jesmond station. I knew from using Haymarket station that I always needed to use the wide gates with our bigger pram, But the BabyStart One Hand Fold went through the normal sized ticket barrier with plenty of space to spare! It handled the bumpy ground with ease on the way to our event venue and inside to the venue it pushed great on the carpets of the hotel corridor. On the way back we had to walk quite quick from our local metro station as we had to get back to pick up James from school, but again the pushchair handled brilliant! Over all I was really pleased with how it handled on our first trip out with it! 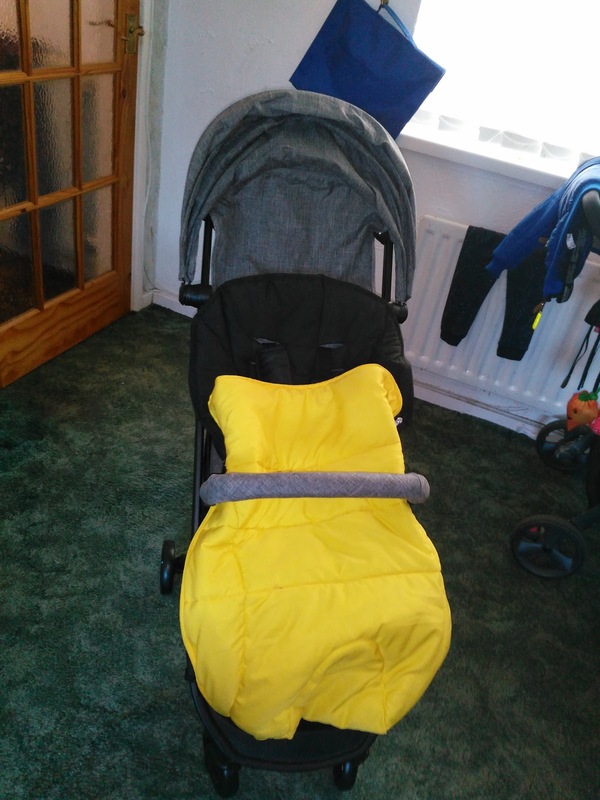 The next test for the pushchair will be travelling via train to visit the boys grandparents in Surrey in a few weeks time! Weekends can be very manic in our house! 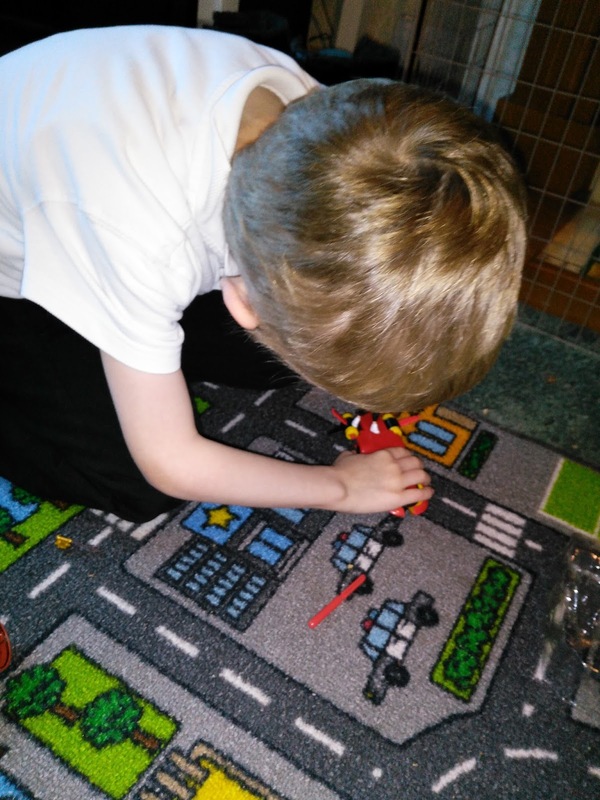 James is normally exhausted after a busy week at school, so he normally wants to chill out in his pjs, but life has to continue homework and the weekly food shop need doing! By the time the kids are fed and dressed and the shopping is done its normally lunch time and James is moaning that he is hungry. This is where the Rustlers Southern Fried Chicken Burgers come in! They are ready after 90 seconds in the microwave! They are a quick, convenient and affordable meal when mums and dads need it most! We were challenged to buy the Rustlers Southern Fried Chicken Burgers and hack them to suit our family!! So what did we do with our Rustlers Burgers to Hack them? As mummy and daddy are trying not to eat bread at the moment so we decided to hack ours by removing the burger from the bun and using wraps instead. The buns were saved thought for the kids! We decided to do ours with sliced peppers and diced onions. We lightly fried the onions and peppers in spray oil. 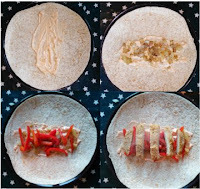 We put Tesco sweet burger sauce onto the wrap and spread it out, we then put a few spoonfuls of the onion onto the sauce, then a few of the sliced peppers on top of the onions. We heated up the burgers following the instructions on the packet and then sliced it up and put it on top of the peppers and onions then folded up the wrap like we would normally do. This was so yummy and a really good and a really quick lunch for a Saturday. Mummy tends to eat wraps for lunch most days so it really was a no brainer to hack ours using wraps. The ones we used for this project were wholemeal wraps, but we also quite like wraps flavoured with herbs. That was how mummy and daddy did the hack on their burgers, but how did the boys have theirs? 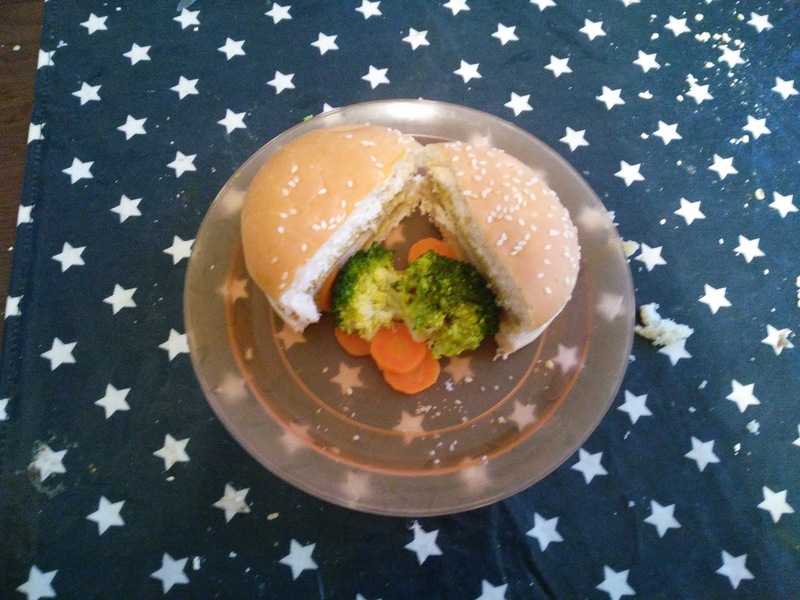 Freddie just had his as it came, but James he decided he wanted to have mustard on his bun instead of the mayo sauce that came in the packet and he had some steamed carrots and broccoli on the side! 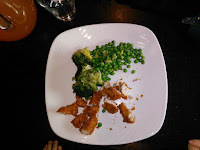 A few months ago the thought of James eating carrots and broccoli with his dinner was laughable! He would never eat them, so for him to ask to have them on the side of his dinner is a big thing! We really enjoyed taking part in this project and would definitely make our hacked burgers again! I think it would even make a great midweek tea for the kids, especially when we have had a busy day of school and playgroup! James is now nearly five and a half years old and he's just over a term and a few weeks into year one at his primary school. My last big update on James was his birthday last August and I thought it was about time that I did an update on my big boy! 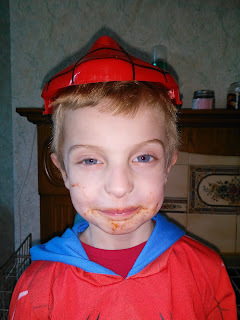 As the photo shows he always seems to get food all over his face and he hates having his face washed so he took to wearing his spiderman mask this day to cover the mess and to stop us washing his face! 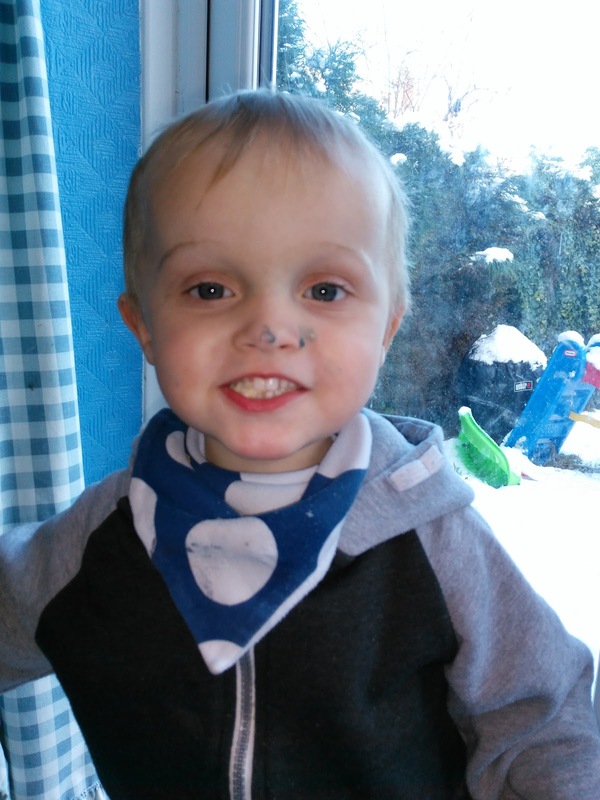 James was the inspiration behind the name Mummy to my little cheeky monkey when he was 20 months old! And he is definitely still very cheeky. He's got beautiful blonde hair and bright blue eyes and is my mini me! 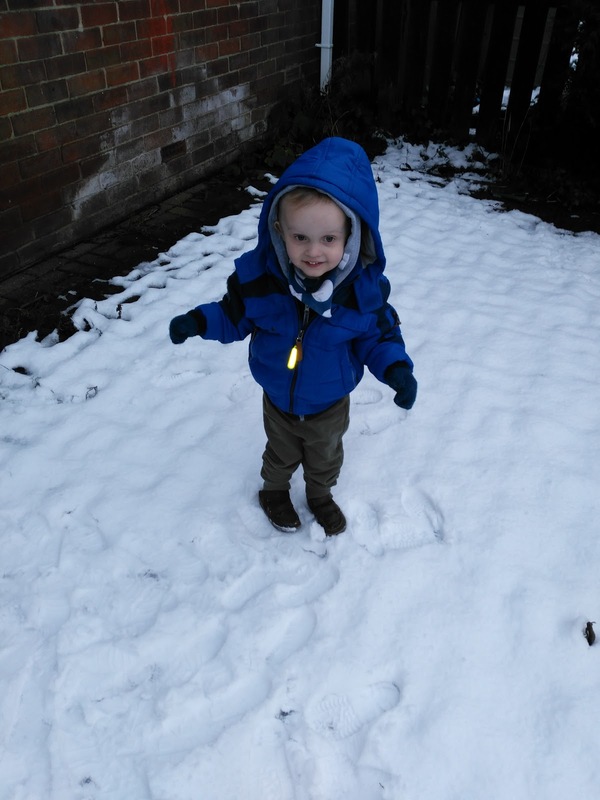 He definitely uses the big blue eyes to get his own way and he had his TA in nursery and reception classes wrapped around his little finger!! Since going into year one at school he has developed a new found love for reading, at bedtime him and daddy have been reading Roahl Dahl books which he has loved! We started last summer reading Charlie and the Chocolate Factory and Charlie and the Great Glass Elevator! We then moved onto The BFG and The Witches. So for Christmas we bought him George's Marvelous Medicine, The Twits and Fantastic Mr Fox. We do a reward Box with James and when he fills his box we have promised him a new book so he is working so hard to get his stars to get his book!! 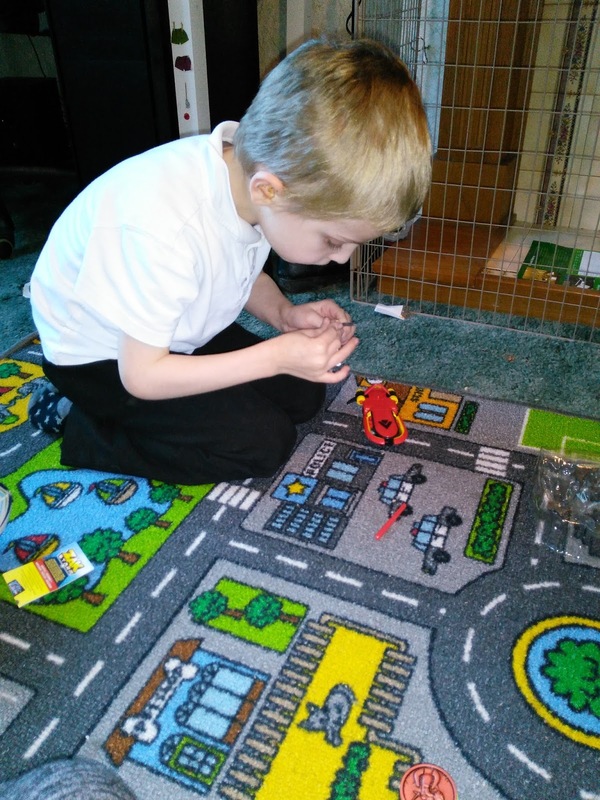 Over half term we are going to visit daddy's family in Surrey and we will be spending a day in London as since he learned about the great fire of London in school and of course seeing Big Ben on Go Jetters he has wanted to visit London!!! We are also going to go and see Buckingham Palace as James loves the Queen. He even asked if he could meet her but mummy told him that would be slightly impossible. He absolutely adores his little brother, well he does most of the time! 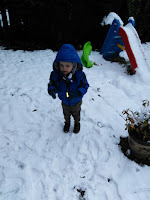 Some days they are thick as thieves and others James wants him as far away as possible! Poor James is often being chased around by Freddie especially when he gets home from school! Freddie is like his little shadow when he gets home as he has really missed him during the day! We are so proud of James and how well he is doing at school. Wow we have made it to week four! It's been another busy week here for James and Freddie. 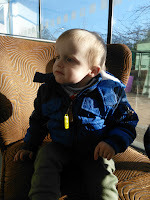 James has been on his second school trip of the term, this time it was to Washington Wetlands, and they have only been back at school three weeks! Freddie has been in playgroup for one session this week and instead of his second session, he came with mummy to an event in Jesmond with Messy Little Thing. 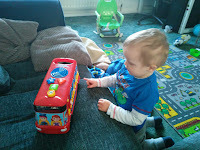 This had been arranged since before his playgroup sessions were confirmed. 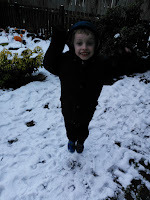 Most of my photos of James seem to be now taken either before or after school! He is so hard to get photos of these days. 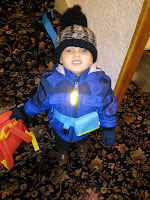 The boys went to a party last week and James never stayed still long enough for me to get a photo of him! This was the only photo I managed to get of him that day at the party that wasn't a blurry mess! 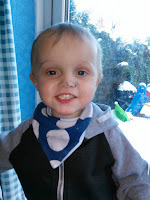 Freddie had a brilliant time at the Messy Little Thing event! He loved self feeding himself his food and of course stealing some of mummys lunch! 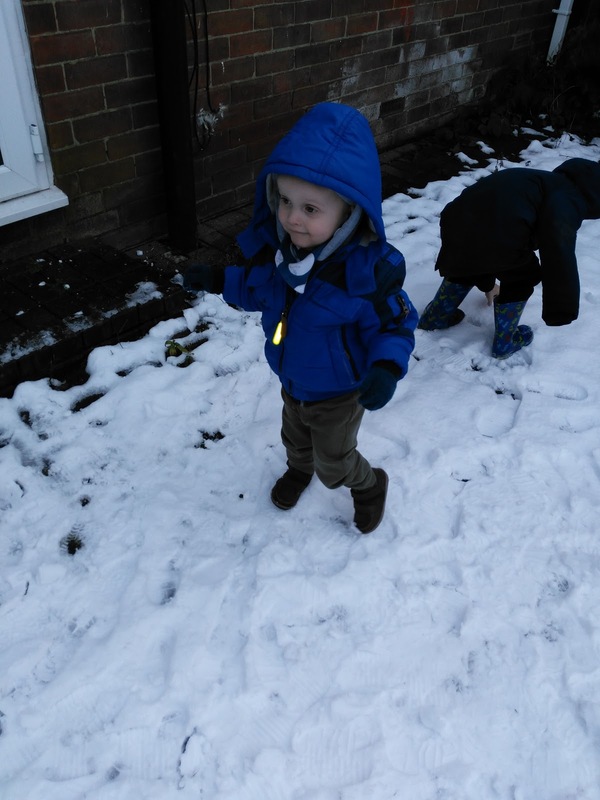 We then on Thursday had our normal Sure Start Fun Play and Learn Group. Last week Freddie did a 2018 handprint calendar for mummy to have above her desk. Then at this session Freddie decided he was going to cover his hands in paint and then try and lick it off and ended up paint on his face! When we woke up on Thursday morning the whole of the outside was white!! 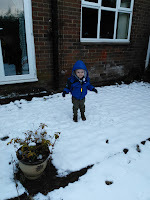 It had snowed a lot over night! 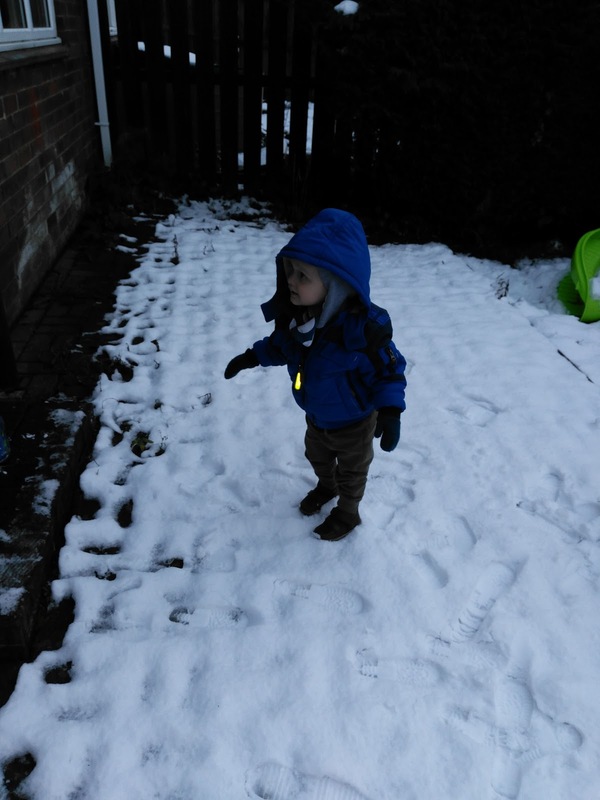 Mummy had been up in the night with a teething Freddie so we had been watching it fall at 1am, The size of the flakes coming down though oh my goodness they were huge! 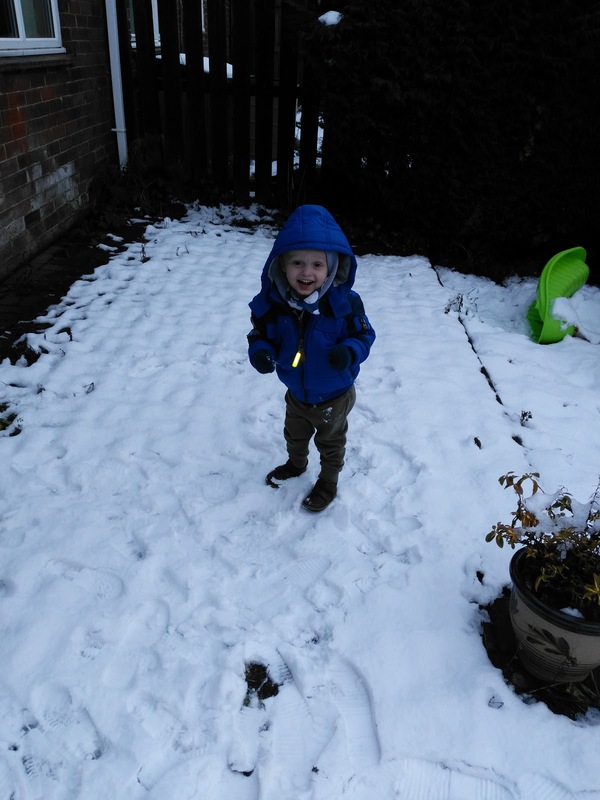 At one point Freddie was sat in his pushchair in front of the open blinds watching the snow fall as it seemed to calm him down! James was thrilled when he woke up to see it was all white and was dressed so quickly for school as he knew he would be able to go walking in it and of course wear his wellie boots to school! 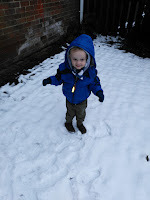 Once we got in from school we went into the back garden to play with the snow! 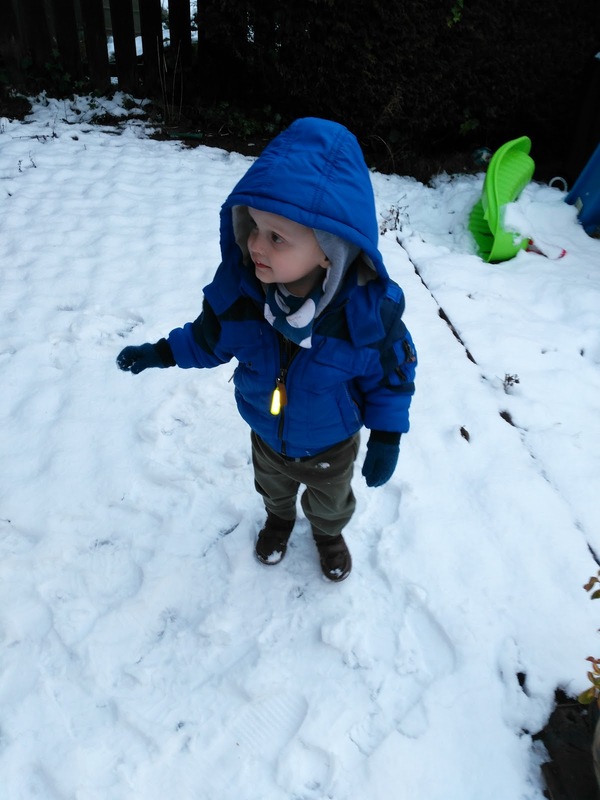 This was the first time mummy had let freddie loose in the snow in the garden and to say he loved it was an understatement! He kept giggling his head off at it! Now all mummy needs to do is buy Freddie a pair of wellie boots!! Now that Freddie is two, he is trying to feed himself his meals more and more, which means more and more mess for mummy and daddy! Daddy even bought us a new hoover to cope with the extra mess! When the email landed in our inbox inviting us to Fratellos in Jesmond to have lunch and try out some products from Messy Little Thing we were thrilled! Freddie is definitely a messy eater, especially when it's messy food! He has been known to eat his sweet corn one bit at a time and with his fingers, so there is sweet corn and gravy everywhere! Messy Little Thing are a small business, specialising in bibs and floor mats for weaning and self feeding your baby and toddler. I decided before the event to look at their website and get a feel for the brand. I have to say just from looking at the site I was impressed! I love that the bibs come with a bag so when its dirty you can throw it in the bag and then it won't mess the inside of your changing bag up or under the pram. From looking at the website I saw that their mission was "to enable parents and carers to relax while their kids are eating and playing. 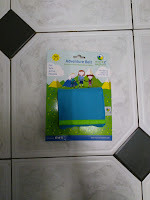 And reduce hours spent scrubbing clothes..."
In the past we have used disposable bibs with Freddie and I have found them to be a nightmare as he can rip them off so easy and they also can get ripped before they are even put on as he is not a fan of them! We had to be at Fratellos for half past one so we left our house about half past eleven as we had about a ten minute walk down to the metro station and we were not sure how long we would have to wait for a train as they are meant to be every ten minutes. Plus mummy always gets lost when leaving Jesmond metro station! Sure enough when we got to Jesmond mummy turned the wrong way out of the metro station and ended up walking round in a circle! 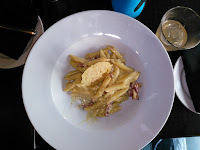 We had to pre order our food a few days before the event, so mummy chose Carbonara for herself and Chicken Strips for Freddie as its one of his favourite things as he can self feed it to himself! Although I knew that more than likely Freddie would help himself to my meal like he normally does! When we arrived at about twenty to one and met the lovely PR Fran. 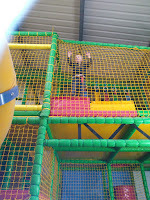 Freddie was a little tinker while we were waiting for the set up to be finished! Once we were inside Fratello's, we were shown to the table where the products we would be testing were set out for us. Freddie was testing the Apron out along with the Messy Mat! 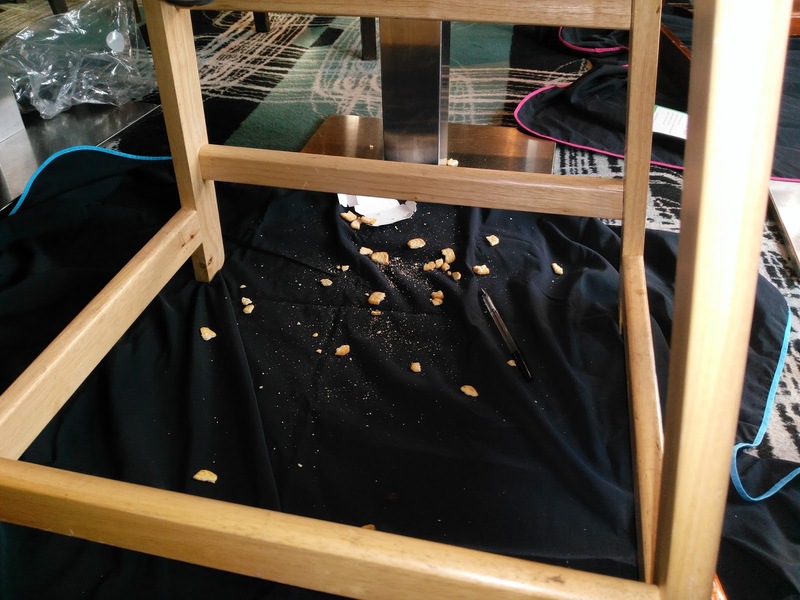 The mat was definitely needed as while Freddie was having a quick snack most of his packet of crackers went all over when he decided to tip it out! 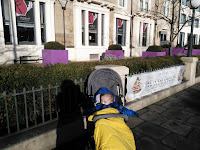 Freddie was free to wander around and look out the windows which he loved as the restaurant faced onto the main road so he got to see lots of cars!! He even saw a couple of ambulances which made him very happy! 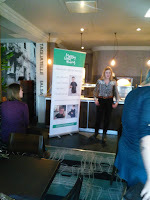 We then had a quick presentation from Dawn who founded Messy Little Thing and she told us the story behind how she came up with the idea for the cover all bibs! I wish these had been around when James was a baby! 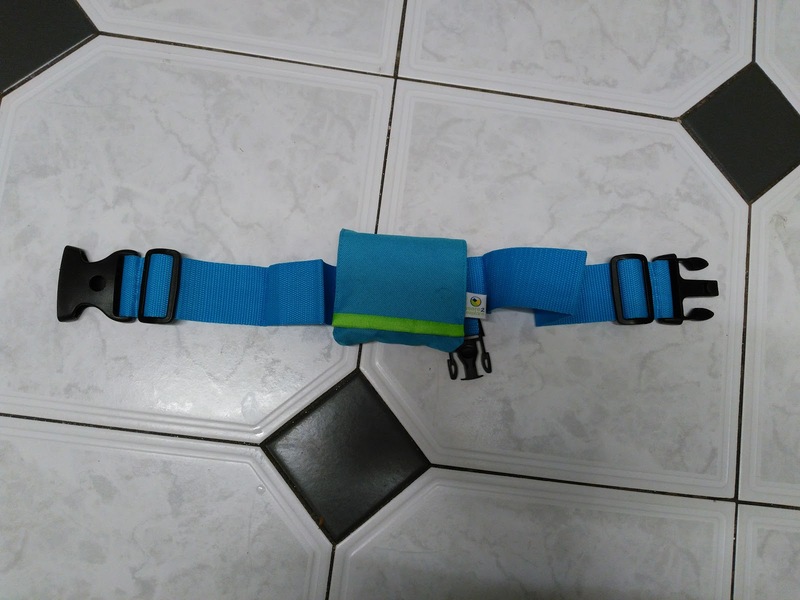 I love the fact they have velcro on the wrists, so you can fasten it around your child’s wrists. I lost count at the number of cover all bibs we went through with James where he still got the arms of his tops dirty as they sleeves didn't fit well!! The apron that Freddie was testing out is one of five products that are now in the Messy Little Thing range! Going from a six month old baby up to the messy toddler which Freddie definitely is!! The food at Fratello’s was amazing! It was the first time that I had actually been there and would certainly go back! Freddie absolutely loved his chicken strips however he soon got bored of his food and decided mummy’s was much more interesting so he shared some of my meal! Thank you Messy Little Thing for inviting us to have lunch and test out the products! We have totally fallen in love with the apron and it will certainly be used for more meals and trips out for Freddie! I’m just hoping that James does not try to steal it!